Madrid, March 19: Spanish Liga Santander strugglers, Rayo Vallecano sacked coach Miguel Angel Sanchez 'Michel' following a 1-3 defeat away to Villarreal. The defeat away to a direct rival in the battle to avoid relegation means Rayo have now lost their last seven matches and now sit second from bottom of the Liga Santander, six points from safety, reports Xinhua news agency. "We thank him (Michel) for his inestimable work during three seasons leading the squad and his unquestionable success, reaching promotion to the Primera Division in 2018, which puts him on the roll of honour of our almost 100 years of history. Our most sincere recognition for his work and our best wishes for the future," reads the statement on the official Rayo website on Monday. Lionel Messi Scores Spectacular Hat-Trick to Power Barcelona to 4-1 Win Over Real Betis (Watch Video). 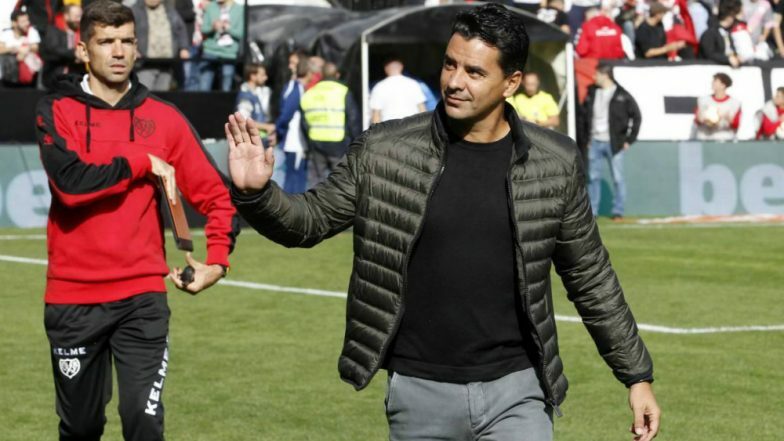 A former legend at the Madrid-based outfit as a player, Michel began coaching in the club's youth system after hanging up his boots and was promoted to the first team job in 2017 as Rayo struggled to avoid relegation from the second division. He was able to save them from the drop and the following season led them to promotion, but the club has struggled to adapt to life in the top flight, spending nearly all season rooted in the bottom three.